I agree and I'm not quite sure how to interpret that. I get it. But it reminds me of an aging high school basketball coach who has become a fan of Women’s NCAA basketball because “they still play the game the right way”. Some people would undoubtedly enjoy watching a high-spin shotmaking shootout. If the PGA Tour thought that this was the majority of people, they’d be mandating a spinny ball. The market wants bombers, bombers are what they’ll get. The reality is that we’re just going to plateau at a new normal. The top quartile guys will all hit their drives the same distance, and tournaments will be decided by short irons and putting - just like they always have been. This week at the Joberg open there was a 16 year old English junior in the field. He hits his 7 iron 225, carry. Some may say he is an exception but it's just what's coming. The PGA Tour average and highest ball speeds are increasing and the average angle of atack is moving towards a positive figure. We are a long way from plateauing. But that isn't just about the ball. That's about his swing and training and all the analytics he gets from the modern coaching these days. And he's probably fit as a triathlon athlete. Work out all you want, the data does not support your conjecture. Everyone's distance exploded with the change in clubs and again with the new ball. The charts are right in the "study". Same guys, more distance. Taller people with a longer arc do get some free distance. But why do you think that there were so few tall players before the equipment change. Distance was still important then. Take a look at George Archer standing over the ball and you'll find your answer. Yes, I am quite aware that the modern equipment is better able to accommodate the tall player. Are you aware that in spite of having perhaps the best short game ever the biggest reason for Tiger's reign was his long game? He had more of a strokes gained advantage in the long game than the short. All of the top tour players are long. Yes, some are longer than others but there are no players on tour hitting it 240. Does not matter how good the short game is they need to have a fair amount of length. And all tour players have a good short game. Like in anything else some are better than others but all can chip and roll the rock. Too many on here imo are looking at the rankings in the charts above and making false assumptions. 290 off the tee is not short. And yet some here are trying to say that Brian Harman is a short hitter at 289.9 off the tee AVERAGE last year. Please don't mistake a pros average for the typical amateur. The amateur thinks that his longest is how far he can hit it but also seems to think the pros average is far as he can hit it. Nothing of the sort. So true, averages do not give the proper insight to distance. As I said, when Spieth hits it 315 yards, Rory or DJ put it out 345 yards. Averages factor in too many variables that can bury the actual performance potential of some of the longer hitters. I never argued that distance is overrated. Distance is always important. It's fundamental to Broadie's strokes gained model. The thing I was pointing out is that the equipment had a lot to do with the distance gains. More so than the "athletic" golfer. The same guys were long before they started working out. Some guys were long and never bothered working out. They are still long. 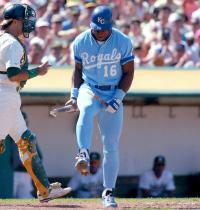 Player was one of the original workout fanatics. He still lagged well behind Nicklaus and Palmer at firestone on big three golf. He hit a lot of 4 woods into those par 4's. I am still scratching my head on the "roll it back" campaign when we are asked to "tee it forward". M5 Tour 9.0 TENSEI TOUR ORANGE 60TX 45"
Distance is about the efficiency of the golf swing. Some guys come by swing speed naturally, Bubba and Daly have led the Tour in driving distance and I'd hardly call either one of them a gym rat. Guys like DJ, Koepka, Day, Tiger and Rory have made a conscious effort to enhance their swing speeds with training. The fact there's almost a 50 yard delta between Rory and Furyk in 2017 and that Furyk is averaging 8 yards less than he did in 2005 shows it's not all about equipment. I had some time today to put together some fun charts for everyone. I don't have statistical significance numbers for each chart, but Titleist didn't do that work, either, right? 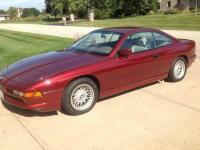 Hopefully pictures are good enough. All data is from PGA tour website, compiled by me in Excel. I get the feel that a lot of you think distance and short game are mutually exclusive. Like if you hit the ball far, you're neglecting your short game. 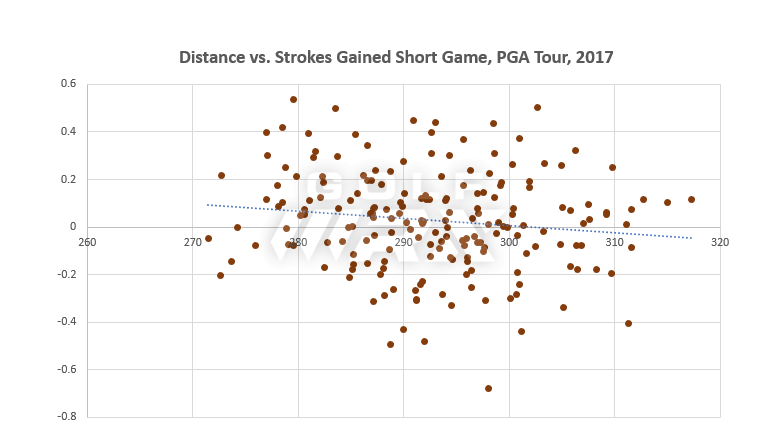 Here are charts of distance off the tee vs. strokes gained in the short game (brown) and putting (red). Maybe some weak correlations there, but I'm not seeing an overwhelming conclusion in either chart. 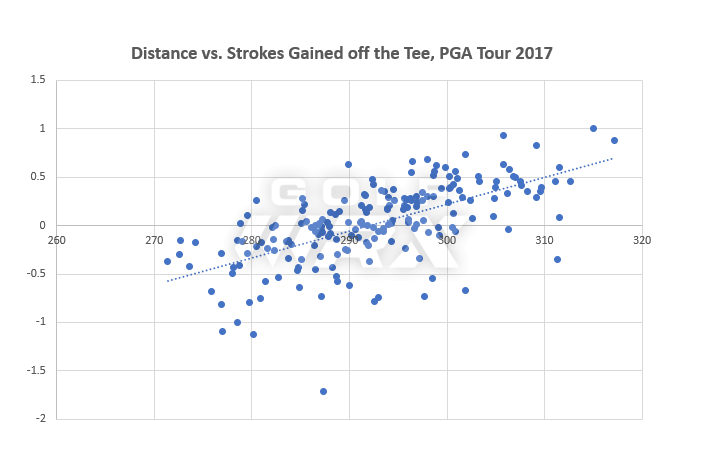 Driving distance seems to make a bigger impact on strokes gained in approach shots (first blue chart). Makes sense... closer you are to the hole, easier the approach. 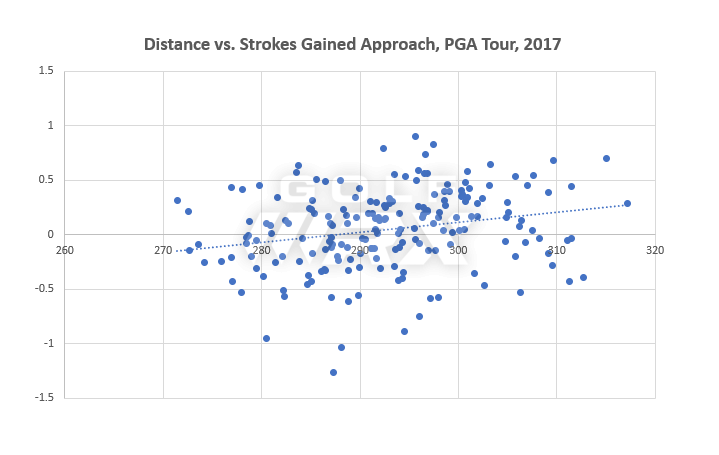 But here is where we start to see a nice pattern... distance and strokes gained off the tee are directly related. Distance is a huge advantage in gaining strokes off the tee. So what about distance on earnings? Well, you can't just take total earnings, you need to control for number of events entered. 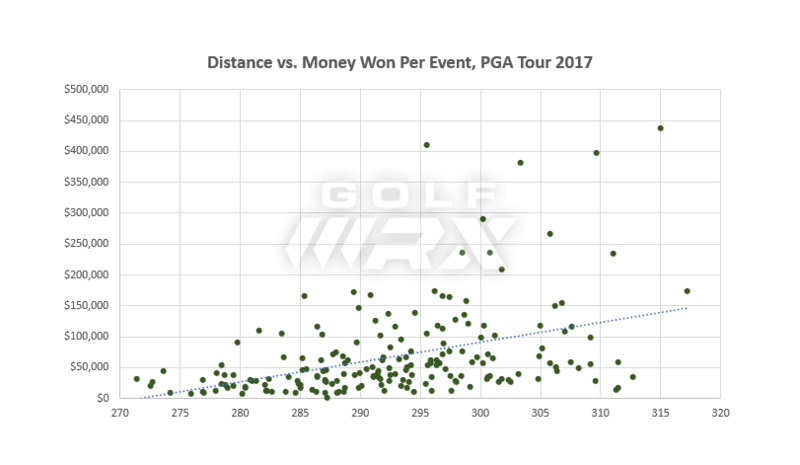 So you look at distance versus winnings per event. Take a look at the green dots. No one under 295 yards averaged over $200k per event. You can cherry pick data all you want, but as you aggregate data points from everyone on tour in 2017, there are clear patterns. Better data = clearer picture. I'd be happy to repeat this for past PGA seasons as I have time. Would be cool to do a 3 or 5 year study and see how (if) things have changed. Perhaps if you're part of the golfing elite. For those of us who play 3 times a month and are in the 14-17 hdcp range, there is nothing EASY about this game, no matter the type of ball we use. I was referring to Tour Pros. It makes sense to have different rules on Tour. Like the move to wooden bats in baseball once you reach a certain level. Yeah Furyk is getting up there in years. Rory was long when he got to the tour. He wasn't working out then, but is now. 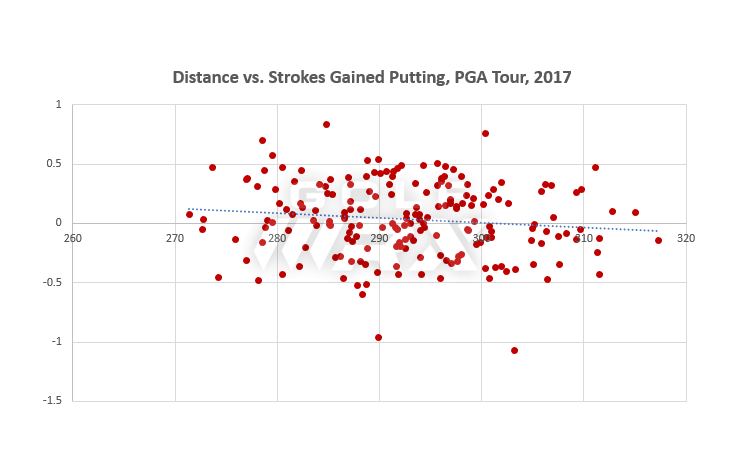 Not much distance gained 310 in 2012, 317 in 2017. That being said then no amateurs can play in pro events. Except those same guys can't do it in a full field big event. Which leads me to hypothesize that these down-card PGA Tour events are played on courses that are set up too easy for them. If I think about the two events that are local to me - the Travelers and the Dell Championship - there is no doubt that the Travelers (where some super low scores have been shot by guys you never heard of) is on a dramatically easier course. Sure they could. They'd just have to follow the pro rules. Kind of like the club rules in unrestricted USGA events like the US Open. Which would indicate it's not really about the equipment. LOL, Jack Nicklaus an anti-technology activist - **** on Wally! It's not a "study" so it can't be the best study. There are a few charts that show some pretty simple correlations and don't even try to explain the other variables or control for them, not a study. It's a PR piece designed to spin (pun intended) all the talk about the golf ball being the problem. Plenty of issues in the debate, Crossfield sensibly addressed some of them besides the golf ball, but this is nothing but unabashed marketing rhetoric by Titleist (and thanks for the ProV1s, I love them). Thanks, but I don't trust any "study" in which the organization has a financial interest in the outcome of said study. By whom? Under what conditions? With what clubs? To make a blanket statement like that every par 4 would have to be pretty short. 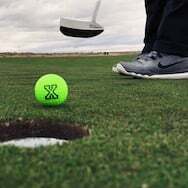 According to the USGA, a scratch player can reach a par 4, 470 yards in 2 shots, and a Bogey golfer should be able to hit a 370 yard par 4 in two shots. So how about the other holes that fall in between? Depends on skill level I suppose. So you're correct, saying that every par 4 should be reachable is incredibly vague. If you can't reach the par 4's in 2 shots, you need to move up a tee. Correct. Unless it's a long par 4 and there's 15mph or more wind in your face you should be able to get to the green in 2. "Take a look at the green dots. No one under 295 yards averaged over $200k per event." It looks like all but 2 of 17 or so the players who average under 280 made less than 50k/event. And neither of those two made over 100k. 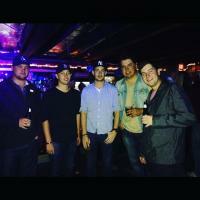 Of the 6 players who made over 250k/event. All but one averaged 300 off the tee. I loved it when I got a 44" graphite shafted driver for my HS graduation from the pro I had worked for the previous 3 years. I could hit it easily 15-20 yards further. Got my first 40 cc driver a few years ago & combined with the B330RX, I could still pop it off the tee around 270+/- at +50 years of age. Liked that too. But a hole over 470 yards, on a course designed over 30 years ago was created to accept a long iron or fairway wood approach. Holes designed to have short iron approaches should have much smaller greens complexes with much more trouble around them. This is why the older courses are being overpowered by today's players & equipment. How can we put that challenge back into the game without the extreme expense of greens re-designs? Are they really being over powered? It's not like a "shorter" course like Harbour Town is surrendering a bunch of 57's as scores. When I start to see the winning score after a 4 round tournament sitting at -40 and the runner ups only being 2 shots behind, I'll start to believe the hype of the courses being "over powered" by the pros. Rory couldn't work out in 2017 because of his rib injury. The 7 yard increase is probably due to a slightly better ball and slightly improved driver. The Travelers, TPC at River Highlands correct? That's where Furyk shot the 58 if I recall.. which would be to your point. Well then Furyk better get that ball and driver cause he's lost 7 yards in the last 17 years. Better equipment fit yes. His answer after going from Callaway Epic Sub Zero To TM M2 is that it "helped him find the center of the face more often." So it's not really an issue of the equipment out of control for Rory. It is a better fitting. Your graph shows minor or no correlation. Just like the Titleist report stated. NOTHING must be allowed to impede on their ability to sucker 23 handicappers who haven't hit a fairway since Reagan was in office into buying four dollar golf balls. 21 guys averaged over 305. 0 averaged 150k or more. Breaking: Leading golf ball company does not want further regulation on golf balls. More at 11.